This month marked the 75th anniversary of the iconic Dambusters raid. The Dam Busters was an attack on German dams carried out on 16–17 May 1943 by Royal Air Force No. 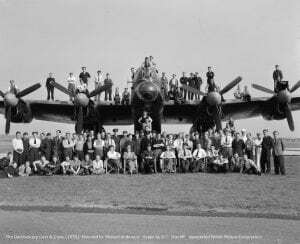 617 Squadron using a purpose built ‘bouncing bomb.’ This military raid inspired the classic film The Dam Busters which was made at Elstree Studios. The film tells the true story of the raid and was the most popular film at the British box office in 1955. On 17th May 2018 The Royal Albert Hall had a special commemorative gala event which was screened in nearly 400 cinemas across the country. To mark the occasion, there was an exclusive video featuring the last surviving member of the raid, Johnny Johnson, discussing his memories of his fallen colleagues. Squadron Leader George “Johnny” Johnson, 96, flew over the Derwent Valley in Derbyshire to mark 75 years since the raid took place. Paul Welsh, Film Historian, says ‘This is a classic Elstree film from the 1950’s. The Studio spent two years in pre-production as it was a prestige production and it had to be accurate. The recently departed director Michael Anderson told me they warned him if they did not like the early rushes he would be replaced but he did a great job. The star was Richard Todd who I had the pleasure to host a plaque unveiling in his honour in 1996 at Elstree. I knew him for many years and the last time I saw the film was sitting next to him at a public screening shortly before his death.